In the past week, Uber has been facing controversy for comments suggesting the company might hire special researchers to battle journalists who haven’t been writing in the company’s favor. The controversy started this Monday, when Buzzfeed’s editor Ben Smith wrote about attending a dinner organized by one of Uber’s consultants. During the dinner, Uber VP Emil Michael talked about “hiring a team of opposition researchers to dig up dirt on its critics in the media”, with a few journalist’s names raised in particular. The media boom spread like wildfire from there. 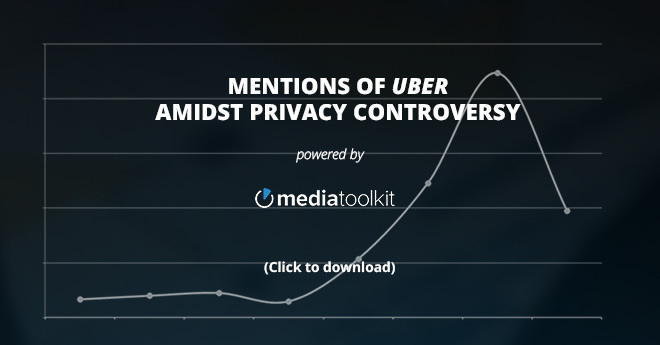 Mediatoolkit was used to track mentions of both Uber and Emil Michael, with various interesting data extracted. We bring it all to you in an infographic. Click here to view it in full.